F Antonín Honejsek (Moose Jaw, 2009-11) has signed a one-year contract with Kometa Brno (Czech Republic, Extraliga). Honejsek started the season with the Espoo Blues (Finland, Liiga), scoring once in two games. He was loaned to Kiekko-Vantaa (Finland, Mestis), and had one assist in one game. He was released on Oct. Following yesterday’s post that included some observations from a former WHL player, another emailed arrived from another former WHLer. Hopefully, this one also will provide some insight into life in the WHL. “Not to sound crazy, but looking at your post about how CHL teams pay their players, it seems there is a discrepancy in the payouts to players from each team. In (City A), I personally got $60 every two weeks, or $120 a month as a 16-year-old. So it outrages me when I hear people complain when they got more than me. “In all, It was said that I made around $400-$500 as a player (according to tax records) every two weeks, but most of that went to my billets. It was included in my pay. “There was a major difference between the teams in (City A) and (City B) when I played for them. The team in (City B) paid for gas and the team in (City A) did not. When I was 19 in (City B), I would make $185 or so plus gas, but in (City A) there would be no gas bonus. “The league needs to hold each team accountable for fees to be paid to players, and not find loopholes or tax breaks in order to pay players less. Do you know how hard it is to fill up a car with gas to drive around your teammates when you make $60 every two weeks as a 16-year-old? Especially if your parents can’t give you a MasterCard? “The university promise has done wonders for me, but I wish there was more when I played hockey for my team, the team I bled and battled for. “For a kid in the CHL, as a 16-year-old, $500 a month would be a lot, but logical. They would be able to not worry about those things when having to spend 40 to 50-plus hours a week at the rink or doing other things for the team. Players are not looking for millions, but fairness. 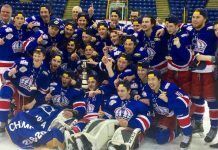 “Yes, the CHL does produce the most players and graduates more than any other league to high professional ranks, but this cannot be indicative or the main argument on why not to pay players more money. Make them feel like professionals and also like human beings. “The best part about the ‘student-athlete’ part is that I graduated from high school at 17 years of age. For the two years after I graduated and still played in the WHL was I still considered a ‘student-athlete?’ Many players who I played with didn’t graduate high school, so how can they be all ‘student-athletes?’ This is all shady to me. It also says something about the situation that this former WHL player twice asked for anonymity. It would seem that intimidation, perceived or otherwise, still is a force in the game of hockey, on and off the ice. Of course, it has long been said that perception is reality in a lot of minds. Czech F Richard Nejezchleb, 20, has been returned to the Brandon Wheat Kings. A fifth-round pick by the New York Rangers in the 2014 NHL draft, he had been with the AHL’s Hartford Wolf Pack. . . . Nejezchleb suffered an undisclosed injury while with the Rangers team at the Prospects Tournament in Traverse City, Mich., and hasn’t played since. However, he now is healthy. . . . Once he rejoins the Wheat Kings, they will have 14 days to get down to the maximum of two import players. Their roster also includes Latvian F Rihards Bukarts, who turns 19 on Dec. 31, and freshman D Ivan Provorov, a 17-year-old Russian. . . . Brandon will be faced with a tough choice as Bukarts went into Wednesday night with 17 points, five of them goals, in 11 games. Last season, he put up 54 points, including 28 goals, in 65 games. Provorov is an early candidate as the Eastern Conference’s rookie of the year, with 12 points, five of them goals, in 11 games. . . . In 101 regular-season games with Brandon, Nejezchleb has 81 points, including 43 goals. 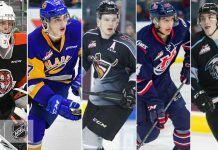 Last season, in 66 games, he put up 57 points, 32 of them goals. . . . Should Brandon keep Nejezchleb, he would become its third 20-year-old, joining F Peter Quenneville, who was named captain earlier in the week, and D Eric Roy, who turns 20 on Friday. . . . As well, Nejezchleb has a two-game suspension hanging over his head, something left over from last season’s playoffs. . . . If you are wondering who might have room for a 20-year-old import: Only the Prince Albert Raiders have fewer than three 20s, and that’s after they suspended F Dakota Conroy who left them earlier this week. Each of the other 21 teams has two imports on its roster. In Swift Current, F Colby Cave scored with 12.6 seconds left in the third period to give the Broncos a 5-4 victory over the Portland Winterhawks. . . . Cave has two goals this season. . . . F Paul Bittner scored twice for Portland, pulling it to within a goal, at 4-3, at 17:50 of the third and getting them even at 19:17. He’s got five goals this season. . . . D Max Lajoie had two goals and an assist for the Broncos. . . . F Chase De Leo scored his eighth goal of the season for Portland, now 2-2 on an East Division swing. . . . The Winterhawks, with goaltenders Brendan Burke and Adin Hill injured, started Bolton Pouliot and had Chantz Vinck of the midget AAA Swift Current Legionnaires on the bench as the backup. Michael Bullion, who has been with the NAHL’s Wenatchee, Wash., Wild, is expected to join the Winterhawks today. . . . Vinck, 17, is from Weyburn, Sask., the hometown of former Portland D Derrick Pouliot. . . . In Saskatoon, F Alex Forsberg’s two goals helped the Blades to a 5-2 victory over the Kootenay Ice. . . . Forsberg’s second goal, at 17:22 of the first period, broke a 2-2 tie. He has five goals over his last three games. . . . Blades G Nik Amundrud stopped 31 shots to earn his first WHL victory. . . . Ice F Jaedon Descheneau picked up his 200th regular-season point in his 203rd game when he scored his club’s second goal, his sixth this season. . . . The Ice, which has lost three straight, is hoping that F Tim Bozon, who is out with an undisclosed injury, can make his season’s debut on Friday against the visiting Calgary Hitmen. Calgary expects to have F Jake Virtanen play his first game of the season after off-season shoulder surgery. . . . In the NHL last night, F Sam Reinhart, who is eligible to be returned to Kootenay, played 9:51 for the Buffalo Sabres in a 4-1 loss to the host Anaheim Ducks. In faceoffs, he was 1-for-8. . . . Taylor Rocca of the Cranbrook Daily Townsman has a game story right here. Ice head coach Ryan McGill said: “Our performance was embarrassing.” . . . Daniel Nugent-Bowman of the Saskatoon StarPhoenix has a gamer right here. He reports that Blades D Ryan Coghlan suffered a shoulder injury in a second-period fight and will be re-evaluated today. In Kamloops, the Blazers had 16 players get at least one point as they whipped the Vancouver Giants, 7-2. . . . The Blazers (8-5-1) moved into second place in the Western Conference. . . . The game turned early in the second period when the Blazers took a 3-0 lead by scoring twice in 12 seconds, F Jake Kryski getting his fifth at 3:09 and F Matt Needham his seventh at 3:21. . . . F Cole Ully had a goal, his ninth, and an assist for Kamloops. He’s atop the WHL scoring race with 22 points, two more than Kelowna F Nick Merkley and Medicine Hat F Cole Sanford. . . . The Blazers put it away with four third-period goals. . . . Vancouver’s PP was 0-for-7. . . . Kamloops G Cole Kehler stopped 28 shots in a solid outing. . . . The Giants were 8-0-0 against Kamloops last season and had won the only meeting this season, beating the visitors 3-0 on Friday. . . . These teams won’t meet again until Dec. 30 in Vancouver. . . . Prior to the game, a moment of silence was held in memory and in honour of Cpl. Nathan Cirillo. . . . In Prince George, the Brandon Wheat Kings opened a seven-game road swing with a 7-4 victory over the Cougars. . . . Freshman F Nolan Patrick and sophomore F Rihards Bukarts each had two goals and an assist for the Wheat Kings. . . . Bukarts has at least one assist in eight straight games. . . . Bukarts has seven goals; Patrick has four. . . . Brandon D Ivan Provorov scored his sixth goal. . . . The Cougars got to within 5-4 at 12:07 of the third, when F Chase Witala scored his seventh goal, but the Wheat Kings, who were 4-for-8 on the PP, put it away with two late ones, from Patrick on a PP and Bukarts into an empty net. . . . The Wheat Kings are in Kamloops on Friday. . . . Rob Henderson of the Brandon Sun has a game story right here. In Kelowna, G Jackson Whistle stopped 22 shots as the Rockets beat the Tri-City Americans, 4-0. . . . Whistle has two shutouts in 11 appearances this season and five in his career. . . . The Rockets had taken their 10-0-0 record into Kennewick, Wash., on Saturday night and lost 5-2 to the Americans. . . . F Tyrell Goulbourne scored twice for Kelowna. He’s got four goals this season. . . . In Everett, F Kailer Yamamoto broke a 4-4 tie with 12.1 seconds left as the Spokane Chiefs beat the Silvertips, 5-4. . . . Yamamoto, 16, is a native of Spokane. . . . Everett (6-1-3) is the last of the WHL’s 22 teams to lose in regulation time. . . . That was Yamamoto’s first WHL goal. . . . F Nikita Scherbak had forged a 4-4 tie with his fifth goal at 11:06 of the third. . . . The Chiefs are 5-0-2 inside the U.S. Division. 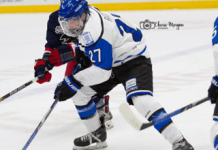 The Victoria Royals have acquired G Jayden Sittler, 18, from the Kootenay Ice for a sixth-round pick in the 2015 bantam draft. . . . Sittler, who is from Red Deer, was with the AJHL’s Fort McMurray Oil Barons, going 2-2-0/3.04/.903. His acquisition leaves the Royals with three goaltenders, the other two being veteran Coleman Vollrath, 19, and Evan Smith, 17. . . . General manager Cam Hope told Marlon Martens, the radio voice of the Royals, that Smith was injured in practice on Tuesday. “That sped up our need to solidify the goaltending position with a player who can come in and play for us right now,” Hope said. F Skylar McKenzie of the Portland Winterhawks was handed a charging major and game misconduct in the final minute of their 3-1 victory over the Pats in Regina on Tuesday night. On Wednesday, the WHL said it had “reviewed the charging major and GM . . . There will not be any further discipline.” . . . In case you missed it, here’s Kootenay Ice head coach Ryan McGill, in conversation with Taylor Rocca of the Cranbrook Daily Townsman, after a 3-2 loss to the Raiders in Prince Albert on Tuesday: ““When you have a good game plan, you’ve got to execute. “Unfortunately, you can lead a horse to water but you can’t make him wear a bathing suit.” . 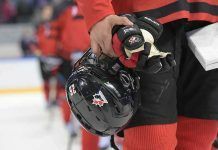 . .
Don’t forget that WHL teams will have players leaving next week to compete at the U-17 World Hockey Challenge that runs Oct. 31 through Nov. 8 in the Sarnia, Ont., area. . . .
Another KHL head coach has bit the dust. Traktor Chelyabinsk fired Karri Kivi on Wednesday, replacing him with Andrei Nikolishin. Traktor was 7-13 under Kivi, leaving it ninth and out of the playoff picture in the Eastern Conference. Kivi is the fourth KHL head coach to be fired this month. Hey played in the whl 4 yrs never went to the parents for $ worked in the summer to cover the extra costs. Debt free education! !